Liberia’s interfaith women’s prayer movement changed history. A brutal civil war between dictatorial President Charles Taylor and rebels led to over 100,000 deaths and the displacement of about 1/3 of the nation’s population. This brutality was halted in large part by Christian and Muslim women who overcame their hesitancy about praying together to pray and act for peace. Their leader, Lemah Gbowee was a recipient of the Nobel Peace Prize. 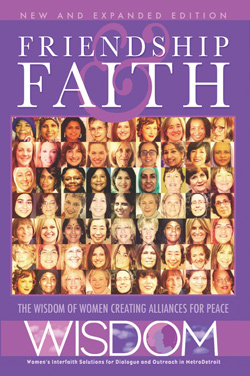 WISDOM purchased a copy of the documentary “Pray the Devil Back to Hell” that chronicles the remarkable action of this women’s interfaith prayer movement. The film was shown at a special event WISDOM hosted in Birmingham. Dan Buttry of the InterFaith Leadership Council has been to Liberia a number of times as part of his global peacemaking work, and following the viewing of the documentary, he told about the growth and challenges of peace in Liberia. After the WISDOM event, Dan borrowed the DVD to show as a part of some of his peacemaking workshops. Dan and his wife Sharon, a WISDOM member, took the film to Kenya as part of a 10-day Training of Conflict Transformation Trainers (TCTT) to equip peacemakers from 7 African countries. The Rev. Jimmy Diggs from Liberia attended that workshop. He had been one of the clergy supportive of the Liberian interfaith women’s movement, joining with them in Ghana during the peace talks that ended the civil war. Rev. Diggs spoke about the on-going work of the women and reconciliation efforts in Liberia. In May Dan led another TCTT in Nigeria with participants from 10 African countries, again including Liberia. The Liberian participants were deeply moved by the documentary, and afterward they shared about the difficult days of the war in Monrovia and the incredible courage and dedication of the praying women. They knew the story from their own direct experience but had never seen the film in Liberia itself. They asked if they could take it and show it as part of their on-going reconciliation and trauma healing work. Dan contacted Gail Katz who quickly gave her blessing to the extension of WISDOM’s work back to Liberia through the further use of the film. So Frederick Gbatu and Gideon Washington are taking “Pray the Devil Back to Hell” back to Liberia to show the story of brave interfaith women creating peace out of the chaos of civil war. wraps up the year at the DIA!! On May 14th, the Detroit Institute of Arts was full of seventh graders looking for religious art. 210 students, parents and teachers dashed about on an unusual scavenger hunt – a Persian frieze, a Native American mask, a Dutch painting, and a mummy – and gathered in the galleries, heads bowed over their discussion guides, deep in conversation. It was the wrap-up for this year’s Religious Diversity Journeys program, and, according to the student feedback, the most popular program of the series. Before starting the search, they were treated to a short presentation by DIA learning and interpretation specialist Sue Troia, who helped organize the program, The group viewed slides of art that depicted or illustrated themes from the year’s journeys through Sikhism, Judaism, Christianity, Islam, Hinduism, and Buddhism. At the end, after pizza of course, the group gathered to look back over the year, evaluate the program, and reflect on what they’d learned. Both parents and students commented on how the journeys had corrected their misunderstandings, given them an appreciation of other traditions, and made them willing to confront stereotypes Many said they had shared what they learned with family and friends. Next year, the Interfaith Leadership Council is thrilled to be able to offer the Religious Diversity Journeys program to seventh graders in ten school districts, doubling the number of kids who had this amazing experience in the 2013/14 school year. Noah of Arc and his wife, Joan, build a boat to survive a great flood. what not to do. They are turned to pillars of salt. what we call the Golden Rule: “Do one to others before they do one to you. The Romans repeatedly crucify Jesus – at Cavalry, Golgotha and other sites – but he resurrects himself each time. provide eyewitness accounts of Jesus’s life from birth to death. Finally Rome tires of throwing Christians to lions and becomes the first country to adopt Christianity as its religion. The Bible is translated from the original English into countless languages. So how many errors did you spot? There are about 20 mistakes, which I’ve listed at the end of this column, and they reflect the general muddling in our society about religious knowledge. Nearly two-thirds of Americans say they believe that the Bible holds the answer to all of most of life’s basic questions. Yet only one-third know that Jesus delivered the Sermon on the Mount, and 10 percent think that Joan of Arc was Noah’s wife. Many Americans know even less about other faiths, from Islam to Hinduism. Several days after 9/11, a vigilante shot and killed an Indian-American Sikh because of the assumption that a turban must mean a Muslim: Ignorance and murderous bigotry join in one. All of this goes to the larger question of the relevance of the humanities. Literature, philosophy and the arts have come to be seen as effete and irrelevant, but if we want to understand the world around us and think deeply about it, it helps to have exposure to Shakespeare and Kant, Mozart and Confucius, and yes, Jesus, Moses and the Prophet Muhammad. Secularists sometimes believe religious knowledge doesn’t matter because the world is leaving faith behind. Really? Faith is elemental in much of the world, including large swaths of America. Seriously. This is not the start of a comedy routine or a reality TV show. It was the start of Bend the Arc’s fourth national, interfaith Community Organizing Residency (COR) cohort, which officially launched the first weekend of May, 2014, at a farmhouse retreat center just north of New York City.Bend the Arc’s COR program continues to be one-of-a-kind in the U.S. by creating a space for organizers working on issues that include immigrant rights, fair wages for workers, and affordable housing from Los Angeles, San Francisco Bay Area, Twin Cities, Chicago, and New York to journey together through a six-month residency program. Over the four-day COR Opening Retreat at the start of May, residents enjoyed trainings and numerous conversations, sharing their faith traditions’ perspectives on the call to work for justice in the world and developing deep relational bonds with one another. The COR program started in 2010 as an innovative initiative at the intersection of faith and social justice, seeking to break down divisive barriers and truly be a place where community organizers from diverse backgrounds and faith traditions could come together. Now in 2014, in its fourth cohort, the need for COR is greater than ever. The first global study of anti-Semitic attitudes shows that more than a quarter of the world’s population harbors intense anti-Jewish sentiment, with region, more than religion, shaping people’s view of Jews and Judaism. The poll, released by the New York-based Anti-Defamation League, also finds that a large proportion of the world has never heard of the Holocaust or denies historical accounts of it. Of those polled, 46 percent have either not heard of the Holocaust that killed 6 million Jews or think it is a myth or exaggerated. “For the first time we have a real sense of how pervasive and persistent anti-Semitism is today around the world,” said Abraham H. Foxman, national director of the Anti-Defamation League. He called the results of the Global 100 Index “sobering but not surprising” and said it would serve as a baseline for the ADL to understand where anti-Semitism is most prevalent and where education is most necessary. The results of the survey of 102 nations and territories revealed stark regional differences, and hotspots of anti-Semitism around the globe. The survey found that the least anti-Semitic place in the world is Laos, where anti-Semitic beliefs are held by just 0.2 percent of the population. The most anti-Semitic place is in Israel’s backyard, the West Bank and Gaza, where 93 percent of people held anti-Semitic beliefs. The 10 most anti-Semitic countries and territories, according to the survey, are the West Bank and Gaza, Iraq, Yemen, Algeria, Libya, Tunisia, Kuwait, Bahrain, Jordan and Morocco. The 10 least anti-Semitic countries, surveyors found, are Laos, the Philippines, Sweden, the Netherlands, Vietnam, the United Kingdom, the United States, Denmark, Tanzania and Thailand. In the United States, 9 percent of those surveyed revealed anti-Semitic views. The poll is based on 11 questions that refer to common stereotypes about Jews, such as “Jews have too much power in international financial markets” and “Jews are responsible for most of the world’s wars.” Those who answered “probably true” to six or more questions were deemed to be anti-Semitic. Overall, 28 percent of respondents answered “no” to all 11 stereotypes presented of Jews when asked if they were true. Asked if a person could still be considered anti-Semitic for affirming only three anti-Semitic stereotypes, Foxman said the ADL purposely set the bar for anti-Semitism very high, so as to make its results conservative. The ADL found that much of the world greatly overestimates the global Jewish population: Nearly half the respondents (48 percent) believe that Jews account for more than 1 percent of the population, and nearly one in five (18 percent) believe they make up 10 percent. In reality, Jews account for 0.19 percent of the world’s people. Though the survey found Muslims to harbor more anti-Semitic views than Christians, Hindus and Buddhists — and Protestants fared better in the survey than Catholics — a person’s region seemed to correlate more strongly with views on Jews than did a person’s religion. Among Muslims, nearly half (49 percent) were found to hold anti-Semitic views. But across the Muslim-majority Middle East and North Africa, 75 percent of Muslims held anti-Semitic views. Muslims outside of the Middle East and North Africa showed lower levels of anti-Semitic attitudes; 64 percent of Christians in the Middle East and North Africa held anti-Semitic views, compared with 24 percent of Christians overall. Regionally, 74 percent of all respondents in the Middle East and North Africa held anti-Semitic attitudes. That compares with 23 percent of all people in sub-Saharan Africa, 22 percent in Asia, 19 percent in the Americas and 14 percent in Oceania, the region with the lowest anti-Semitic scores in the world. The survey shows that Greece, at 69 percent, has the highest levels of anti-Semitic attitudes of any country outside the Middle East, a proportion far higher than the Western European average of 24 percent. Already, Foxman said, “the prime minister of Greece had learned of our findings and requested that we come and visit.” A large majority of respondents (74 percent) said they had never met a Jew, and of those, one in four displayed anti-Semitic attitudes. Of the 26 percent of people worldwide who harbor anti-Semitic attitudes, 70 percent said they had never met a Jewish person, the survey showed. Survey researchers polled more than 53,000 adults in 96 languages. The study has a margin of error of plus or minus 4.4 percentage points for most countries. The survey was funded by a grant from New York philanthropist Leonard Stern. Foxman said the survey cost “a lot” but declined to disclose the exact cost.